There are currently nine known gill monogenean species of Diaphorocleidus Jogunoori et al. 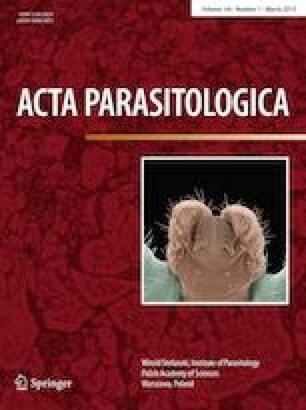 (Systematic Parasitology 58:115–124, 2004) (Dactylogyridae) which are dispersed within and/or among five fish families in the Neotropical Characiformes: Bryconidae, Acestrorhynchidae, Characidae, Iguanodectidae, and Hemiodontidae. During a fish parasitological study carried out in the Rio Lacantún from Chiapas, Mexico, a new species of Diaphorocleidus on the gill lamellae of Brycon guatemalensis Regan, 1908, was discovered. Our objective was to morphologically describe the new parasite species by comparing it with previously described species of Diaphorocleidus and other known dactylogyrids on Characiformes. Worms were fixed with 4–5% formalin solution, observed and measured as temporary or permanent mounts stained with Gomori’s trichrome, and mounted in Canada balsam. In addition, some specimens were mounted on slides using a mixture of lactic acid (LA) and glycerin-ammonium picrate (GAP) and then remounted in Canada balsam to obtain measurements of the haptoral structures and copulatory complex. Drawings were made with the aid of a drawing tube using a Leica microscope DM2500 with Nomarski interference contrast. The new species differs from previously described congeneric species in having comparatively biggest body size [i.e., 800–1200 µm vs. 222–340 µm in Diaphorocleidus armillatus Jogunoori et al. (Systematic Parasitology 58:115–124, 2004) (type species of the genus)]; two prostatic reservoirs; rod-shaped accessory piece; a sucker-like structure associated with the genital pore; vaginal duct looping left intestinal cecum and opening on the dextro-dorsal margin of body; anchors with conspicuous basal folds on the deep roots weakly developed. Consistently with the previous phylogenetic hypotheses about the origin of bryconids (20 mya late Oligocene–early Miocene) in Central America, that morphological differentiation in D. machacae n. sp. in Mexico may somewhat reflect the insights of an early dispersal of a common ancestor of Diaphorocleidus to the area in comparison with that of a late invasion of their congeners [i.e., according to the origin of B. petrosus (10 mya) 10 mya] in Central America. The present finding brings to ten, the number of known species of Diaphorocleidus, and represents the second described species of this genus occurring in a freshwater native host in Mexico. This study was supported by the project ‘‘Conservación, manejo y restauración de los ecosistemas acuáticos del Río Lacantún’’, promoted and coordinated by the Centro Interdisciplinario de Biodiversidad y Ambiente (CeIBA), A. C. with financing from Natura y Ecosistemas Mexicanos A. C. Permit for fish collections were issue by the Secretaría del Medio Ambiente y Recursos Naturales (SEMARNAT), Mexico (permit number: SGPA/DGVS/03492). We thank Delane C. Kritsky for helpful comments on an earlier version of this manuscript.